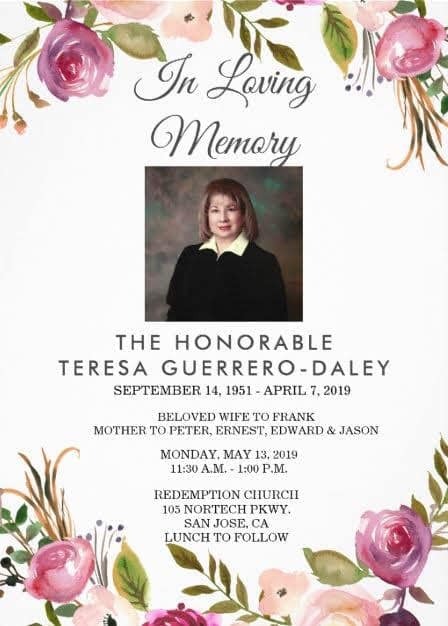 Teresa Guerrero-Daley—who served for more than a decade as San Jose’s first-ever independent police auditor—died of cancer Sunday in her family home. She was 67. While campaigning for the bench in 2004, Guerrero-Daley would tell voters that she dedicated her life’s work to the ethical administration of justice. A native Spanish speaker who was once terrified of public speaking and almost didn’t graduate high school, she went on to earn a juris doctor from Lincoln Law School and became the first female special agent for the U.S. Drug Enforcement Administration assigned to San Jose. In that role, she worked on many an undercover operation to crack down on possession, transport, import and manufacture of illegal drugs. Later, as an attorney who ran her own practice, she tried complex cases, including a death-penalty jury trial. From 1993 to 2005, Guerrero-Daley helmed the office of San Jose’s Independent Police Auditor (IPA), where she ushered in a new era of accountability for local law enforcement. At the time, San Jose’s model was pioneering. Unlike citizen review boards in other cities, which examined individual complaints against police officers and issued recommendations to the chief, the IPA scrutinized organizational shortcomings. Samuel Walker, author of Police Accountability: The Role of Citizen Oversight, recounted in a Mercury News column a meeting he had with Guerrero-Daley during the early part of her tenure as IPA that made him appreciate the value of that approach to oversight. Calling the job challenging would be an understatement. As the city’s inaugural IPA, Guerrero-Daley faced plenty of criticism, according to a 1996 article by San Jose Inside’s parent newspaper Metro Silicon Valley. Colleagues say Guerrero-Daley brought that same ethos to the bench, serving as a trial court judge from 2005 until her retirement in 2017. In 2011, inspired by her own struggles as a teenager and moved by the difficulties she saw youth facing in juvenile dependency court, she founded the nation’s first middle school education court, a program designed to improve academic outcomes for foster kids. Despite the demands of her career, Guerrero-Daley managed to make time for community service. She co-founded the Silicon Valley Hispanic Foundation and the San Mateo County La Raza Lawyers Association. She also served on a number of nonprofit boards, including that of the Arts Council of Silicon Valley. Though not an artist herself, she would often say that she loved being around creative people. Los Lupeños de San Jose shared condolences as well. Guerrero-Daley is survived by her husband, Frank Daley, a retired policeman and their four sons, Peter, Ernie, Edward and Jason. The family will host a memorial service at 11:30am on May 13 at Redemption Church, 105 Nortech Parkway, San Jose. To send condolences to the Daleys, address correspondence to P.O. Box 506, Morgan Hill, CA 95038. Jennifer Wadsworth is the news editor for San Jose Inside and Metro Silicon Valley. Email tips to [email protected]ews.com or follow her on Twitter at @jennwadsworth. Santa Clara County voters deserves judges who take sexual violence seriously and who are not biased in favor of privileged perpetrators. A great role model and person. RIP.